Hello and Happy Monday friends!!! Today I’m on a plane on the way to Charleston, South Carolina for a fun project I am doing with the Inspired Home!! Head to my instastories to see more! More importantly, I’m looking forward to seeing the ocean, palm trees and sunshine! It’s the time of year where I start to get cabin fever with the city! With spring on the horizon, I’m thinking spring outerwear – all the colors and light-weight materials! 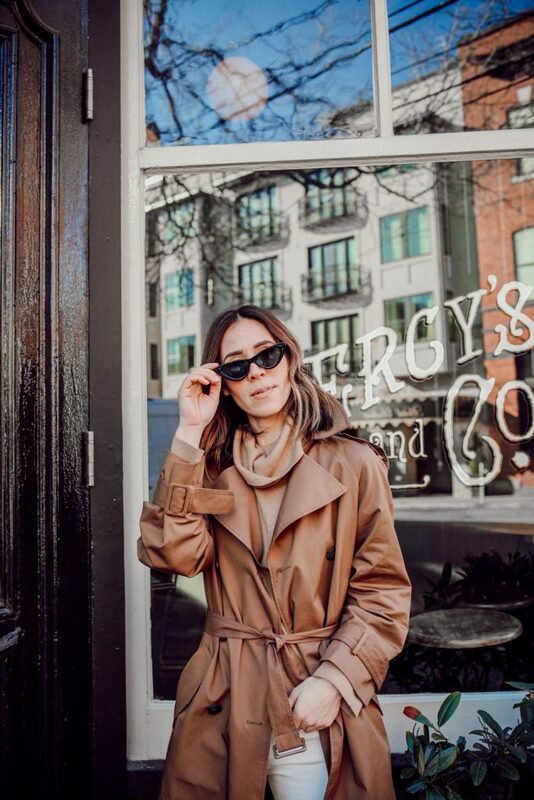 A few weeks ago I visited H&M and found this AMAZING $35 trenchcoat – this trenchcoat is a high quality product that will elevate your spring look in two seconds! 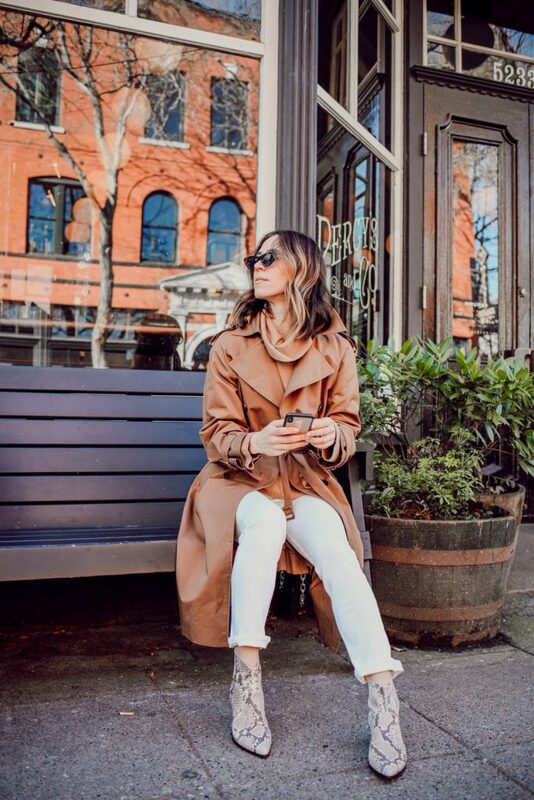 $35 Trench Coat // If you are in the market for a good trench this season try this super low investment, yet high quality, from H&M. It comes in this dark / brownish color and a lighter version that is your more traditional trench color! Honestly, I thought the product was tagged incorrectly when I saw that it was $35!!! This is why I love H&M and will continuously shop their products! 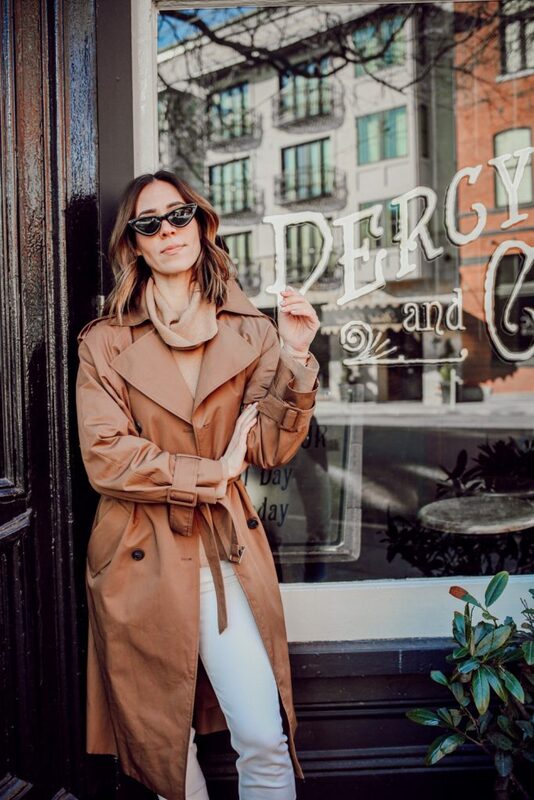 We are headed to Japan next month and I’ve been on the hunt for the perfect coat to wear for traveling during the spring months! Since I’m so sick of wearing black this winter, I wanted to mix up the colors a bit with this tan Sweater (also from H&M) and these white Denim pants (ALSO from H&M). Are you seeing a pattern here? I love a good neutral palette this time of year and really helps break up all the winter drab. AND these pieces can easily be worn in to spring and then again in the fall! Who doesn’t love versatility? For my accessories, I went with my go-to cat eye Sunglasses and my new favorite Snakeskin Booties from Steve Madden that are on MAJOR sale! They come in a few other colors – I’m going to try the tan suede too for spring. They are such a comfortable and versatile bootie! BUT if you’ve been looking to get in to the snakeskin trend, try dipping your toe in the water with these boots!